"I am sad. I miss my friends." It's really quite simple, nothing more to say. I love and miss you all. But let's not get the water works going again. I also feel excited and energized this week. And what's that all about, you reasonably ask? -1- You like me, you really like me! My CNMC reflection post has accumulated some beautiful comments, and each one has made me inordinately happy. I have responded to each and every one of you. This is a small time blog here at Life of a Catholic Librarian, I don't get a ton of regular comments. And that's ok! I know you're out there, reading. But I do love getting comments, and responding to you personally. So, you know...if you want to, please get on the comment train. ...this is kind of a big deal for me, I NEVER do things like that. But I love Allison, and I love the CNMC, so HELLO THERE! And so here is my big radio debut, if you'd care to listen. I appear somewhere around the 12 minute mark. Allison asked me to be on A Seeking Heart again as a guest to talk about books and blogging, so you know, I got all tongue tied and blushy. :) But I am THRILLED! That will be later this year, I'll keep you posted on the date. One interesting little tidbit from my conversation with Allison yesterday was that she asked me what I write about here on this humble blog. And do you want to know what I said? "I like to make people laugh." I didn't even think before I spoke, I just said whatever came into my heart and mind. And you know, that is so, so true. I write about books a lot, I write about Catholic stuff a lot, and about my family, but what holds all of that together is that I like to write humorous stories that make all of us feel a little lighter as we navigate this journey of life together. That was very eye opening for me. I feel a renewed energy for my writing, and I'm so glad that you are all here with me along for the ride. Seriously. If you're ever going to be in Western New York, please let me know, because I will buy you a drink. I MEAN IT. EMAIL ME. Is it any wonder why I love her so much?! 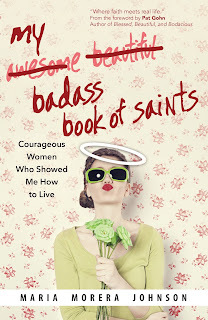 Her book title has the word "badass" in it. No more needs to be said to prove her awesomeness. "What's up with that taxim right in the middle, that seems terribly odd?! Next!" It's a labor of love, to be sure. But love it I do, so all of this practicing will be my summer workout. I'll talk to you all next week! 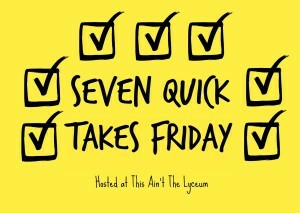 And don't forget...more 7 Quick Takes over at This Ain't the Lyceum! Tiffany - It was truly great to spend time with you at the CNMC. I loved hearing you on Allison's show. Can't wait to hear when you are on again! Hopefully I'll see you again next year at CNMC '16! !